Kentucky Farm Bureau Federation’s 96th Annual Meeting. Some would describe the annual meeting as a business meeting, others as a time for celebrating the year’s accomplishments. For some 96 years may seem like a long time, but to Farm Bureau members that span of time represents the growth of an organization and also a legacy of commitment to Kentucky Agriculture. This year’s theme “A Good Thing Growing” highlights the fact that farm bureau is a vibrant collective of both young farmers, but also dedicated producers who have shared in the triumphs of creative thinking and dedication to an industry that continues to drive Kentucky forward. Delegates from all of the state’s 120 counties assembled for the four-day event to participate in committee meetings, business sessions, award presentations, officer elections and to adopt 2016 priority issues and policy revisions. Growth can be measured in many ways, but at this year’s annual meeting the organization showcased the continued successes of county programs through the various award ceremonies and gold star’s that highlighted various program and committees that had achieved higher benchmark when compared to previous years. The Galt House bristled with members who came not only to share experiences, but also learn about various policy efforts, programs and issues facing Kentucky agriculture. Of those efforts highlighted examples included increased efforts related to Water Resources, Tobacco/Farm Labor, Equine, and Beef among others. Collaborative efforts on display as well as support of research efforts, allowed members to keep tabs on the changing face of agriculture nationwide. In addition, Specialists noted that profitability in the grain sector will continue to be challenged and increasing livestock/meat inventories will put downward pressure on prices. The equine and poultry industries are expected to have solid years. Tobacco reductions may stabilize in response to an improving global world/supply demand balance. Cash flow/working capital will become concerns for some highly leveraged producers as profit margins deteriorate. Look for a continued growing demand for local produce and value?added agriculture. 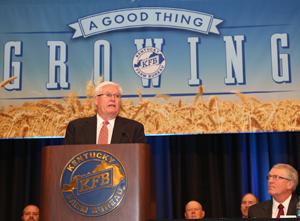 KFB has served as the “Voice of Kentucky Agriculture,” representing the interests of agricultural producers and rural communities. Covering all of Kentucky’s 120 counties, Kentucky Farm Bureau is the state’s largest general farm organization and continues to represent this vibrant industry. Here’s to 2016!